Both powered by Pym Particles and able to shrink to the size of an ant, Scott and Cassie Lang have more in common than a family name. So this two-pack (the last Toys Я Us exclusive to get any kind of actual distribution) was clearly meant to go along with the theatrical release of Ant-Man and the Wasp, but the chain's closure put paid to that. Yes, it (and one more exclusive) did show up at some scattered stores, depending on their geographical relation to the distribution centers, but nothing as extensive as the Vision and Scarlet Witch set. Fortunately, Entertainment Earth picked it up. This is not our first Scott Lang Marvel Legend, even if you ignore the three movie versions. 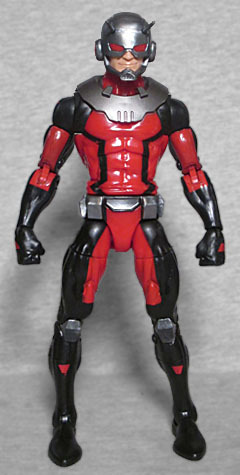 Remember, the Ant-Man in ToyBiz's Walmart-exclusive ML series was also Scott. He may have dressed exactly like Hank Pym, but the fact that he had red hair made it clear who he was meant to be. At the time in the comics (post-"Avengers: Disassembled"), he was dead, but since that time he's come back to life, taken over leadership of the Future Foundation, beaten up Dr. Doom, moved to Florida, and lived inside an Iron Man playset because the rent was too damn high. Scott did eventually get his own costume, rather than just wearing Hank's hand-me-downs. The first was "eh" and the second was "blah," but this one is pretty nice. You can tell it's influenced by the movie suit, being mostly black with red panels on the chest, arms and legs. Technically the panels around his ribs should be darker than the stripe down the center, more of a brick red or a brown, but maybe that was changed for budgetary reasons. The black lines on his torso vaguely suggest an insect shape, while the triangles on his shoulders, hands, and shins tie in with his size-changing abilities. 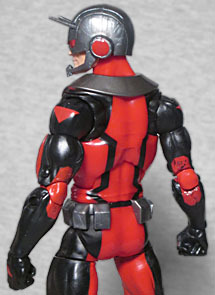 The starting point for the figure's sculpt is the same used for Sunfire, with the pec hinges and so on. But he gets more new parts than you'd expect, including angular kneepads, a new pelvis with the boxes of his belt molded on, and a fully unique torso instead of just having his metal collar be a loose piece dropped onto the mold the way you'd expect. The head is new, too, and done in the most expensive (yet best-looking) way possible: the pink parts of his face and the silver parts of his helmet were molded separately, then combined for a realistic layered look. The head balljoint is slightly loose, as are the lower legs to various degrees. But I'd rather have that problem than have something break. In the late '90s, Marvel's long-running What If--? comic was nearing the end. One of the final issues published introduced "Mayday" Parker, the spectacular Spider-Girl. She proved so popular that Marvel created an entire family of titles around her - MC2, which imagined the next generation of the Marvel Universe, if the characters had been allowed to age and create families like real people. Also in the late '90s, ToyBiz got in the habit of releasing little sub-series that featured four related figures: The Dark Side, which featured horror-influenced characters, or The Modern Age, which was really just a "here's a Wolverine and three figures we couldn't find anywhere else to put." In 1999, one of those series was called 1st Appearances, but exclusively comprised female characters from the MC2 books, like Wild Thing, the daughter of Wolverine and Elektra (and a pre-cursor to X-23), or American Dream, whose real name is Shannon Carter. Anyway, the point is, this isn't the first action figure of Stinger. Although Stinger is Cassie's identity from the future, she recently adopted it in the current day, as well. You can tell that's the version this toy represents, because it uses the teen body instead of an adult one. The costume design is the same on both, a bright central body with black accents: boots and gloves, but also the slashes around the ribs and the typically Ant-Man-ish circle in the center of the chest, with stripes running from that over her stomach and up to her shoulders. The silver pads on her shoulders and the gloves that allow her to fire blasts of energy are simply painted on, rather than being new molds. 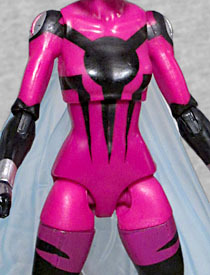 The shade of the magenta used for the body is noticeably different between the painted and molded sections, and even was in the stock photos. They really should have painted everything. In the story, Cassie got the Stinger identity and costume when she signed up for Hench, an app that lets people hire supervillains - basically an Uber for crime. She'd been more or less retired ever since her death, so Power Broker, the guy behind the app, gave her the new suit. The helmet is a really cool update of the classic Ant-Man look, upping the insectoid appearance just enough to stand on its own. 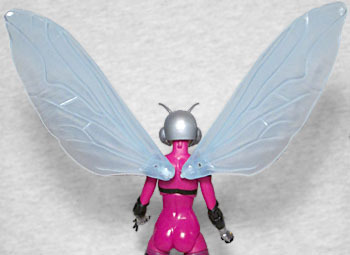 The figure's chest is a new mold, because it had to be remolded to provide ports for her wings. She doesn't get the extra smaller wings that Beetle, Beetle, and Wasp had, just the big ones. Though they still have the hole where the smaller ones would plug in. Sadly, the hinge joint on one of the wings I got was stuck fast, and broke when I tried to move it. In a perfect world, that wouldn't be a problem - I'd just take the set back to TRU and get a replacement. But now that's not an option, so once again, eff you, Capitalism. I wasn't expecting a lot from the Ant-Man in this set, but having so many new molds does him a big favor. Cassie is fine, despite her paint issues and the breakage I experienced, but seriously, who on Earth wanted a figure of her as Stinger and not as Stature?